One of the less described chapters related to the military history of the Insubrica region is the mercenary service of Ticino people carried out in behalf of other military powers. IH has already written about Generals Mainoni, Remonda and soon will about Andrea Brilli an officer in Russian service, but there are more personalities who are interesting to commemorate. For example, Bernardo Pellegrini (1776-?) born on 18 August 1776 in Ponte Tresa, son of Francesco and Maddalena Scolari. He spent most of his life in the military, leading Napoleon and Dutch troops. At the age of 21, he became a Lieutenant in the "Città di Lugano" (in English: city of Lugano). Following examples of other Ticino natives, Bernardo was soon enrolled as a Lieutenant in the French Napoleon Army. Pellegrini fought in First Swiss Regiment which was created by merging together survivors of thirty three Swiss battalions of the old Confederacy. He spent 14 years in the military service under Napoleon, fighting in the campaigns of Danube and Russia, during 1803-1806 in Corsica, being later enrolled in the "Armata d'Italia". When Napoleon's army was defeated after the Russian campaign of 1812, Pellegrini returned in Metz in 1813 together with Captain Giovanni Maria Magatti, born also in Lugano, who had distinguished himself during the Russian campaign at the battle of Berezina. Consequently, Magatti was awarded in 1815 with the Swiss medal of "Treue und Ehre" (in English: Honour and Fidelity). As for Bernardo Pellegrini, he briefly joined the Swiss military service where he became on 2 June 1815 Lieutenant-Colonel of the "Ticinesi militia". 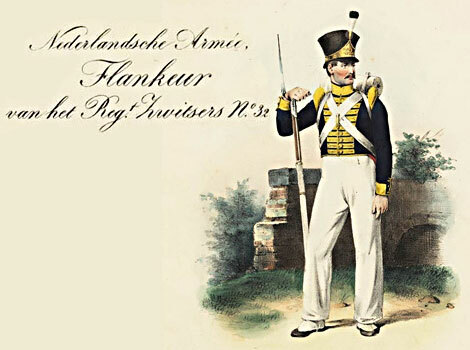 He was used to a nomadic military life outside his homeland region and didn't stay quietly for a long time in Ticino as on 15 October 1815, he joined the Dutch military service in the rank of Lieutenant-Colonel, becoming a commander of Swiss Regiment 32 under General Auf der Mauer. Pellegrini hired for his unit several servicemen from Ticino, particularly natives from Ponte Tresa, Magliaso and Lugano. The Wien Congress of 1815 reshaped the frontiers of Europe with a new emerging Dutch state that needed an experienced army. Renewing the tradition related to the engagement of Swiss natives in the military service for the Dutch Empire (see also our future article on military architect Pietro Morettini), King Wilhelm VI started in 1814 to recruit extensively Swiss natives, creating four Swiss Regiments for a total of approx. 10'000 men. For example, Fourth Regiment was composed of natives coming from the Roman-Catholic Swiss Cantons, Central Switzerland and Ticino. The Swiss regiment was initially stationed in the garrison of Antwerp, later it was moved to a number of cities in the Netherlands, most likely in Louvain (Leuven), Mechlin (Mechelen), Bergen op Zoom, ’s-Hertogenbosch, Gorinchem, Dordrecht, Gouda, Brill (Brielle) and Hellevoetsluis. To be noted that the regiment never executed its military service abroad. As a matter of fact, enrolling volunteers on mercenary service was a lucrative business of that time, and frauds were inevitably committed which affected particularly Fourth Regiment. The scam was related to an agreement called "Militärkapitulation", signed by several Swiss Cantons in order to provide human resources for the Dutch Empire. The terms of the agreement stipulated to select servicemen only of the Swiss nationality, but the Canton Ticino started also to sign up Italians from Insubrica. Dutches were furious and reacted harshly between 1819 and 1821 checking scrupulously every single serviceman's origin. Consequently, the investigation resulted in 1821 in the dismissal of Commander Ludwig Auf der Maur (1779-1836) as well as in purging entirely Swiss Regiment 32. Most likely, the issue related to the abuse of the agreement was not only limited to the servicemen from Ticino as 15-25% of the overall military forces were dismissed from the Dutch service. Bernardo Pellegrini was affected by the Dutch investigation and was forced to leave the Dutch service on 1 September 1821. The true reasons for his dismissal are unknown, but he was replaced by Colonel Göldlin von Tiefenau, a native from Lucerne. 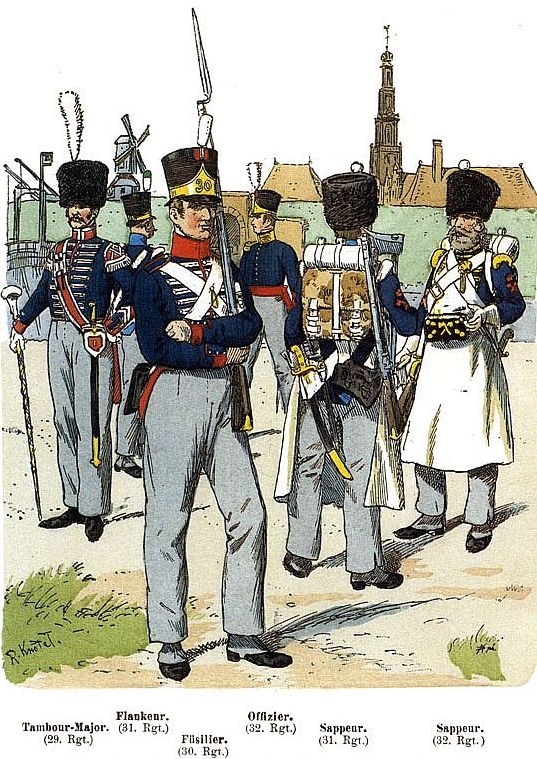 The Swiss engagement with the Dutch army ended in 1828 merely for financial reasons as keeping mercenary regiments became too costly for the Dutch Kingdom. The last Swiss remaining unit was merged finally with the National Dutch Army. The whereabouts of Bernardo Pellegrini after his dismissal from the Dutch service are unknown. Most likely he returned to the Canton Ticino to his native hamlet of Ponte Tresa.